The convergence of a number of calendar events are celebrated at this time. As we reflect on the meaning of Advent, Christmas and Summer Solstice in our Southern Hemisphere we find an alignment. At Rahamim and other places, we celebrate them as one. Those of ancient Earth traditions celebrate this seasonal moment as “Litha”. The actual moment is 22nd December at 9:23am Australian Eastern Standard Time. This is the moment of the longest stretch of sunlight of the year and the beginning of the tip into gradually increasing darkness. Fruits open, greenery is everywhere, cicadas sing. It is the time of reaching capacity, fulfilment and letting go. The seasonal moment also has significance in Australian Indigenous traditions. Historian Bill Gammage teaches us that across Australia the creation story is essentially the same, with all of life’s origins in light: God made light, brought into being spirits and creator ancestors, and set down eternal Law for all creation. Change and time exist only as cycles: birth and death, the passage of stars and season, journeys, encounters. The moment of greatest light holds great significance. The sun is a million times larger than Earth. Brian Swimme teaches us that just one billionth of the sun’s energy reaches Earth. Because of this, everything on Earth is able to take place. He writes, “In one of the great moments in the history of the earth, early creatures began to fashion molecules to capture the sun. They invented chlorophyll which captures a photon of light. We are a result of the activity of many creatures that have gone before us. The earth is bonded with the sun in a way that is more than just physical. Earth recognises the sun and what it holds out. Life is the ecstasy of the sun and the earth. In the Christian calendar, it is Advent – a time of longing and waiting. In our Southern hemisphere our sensitivity to the spiritual implications of this longing and waiting time is heightened. The light we wait for is the light of Christ, piercing the darkness of our blindness and opening our minds to new insights and inspirations. 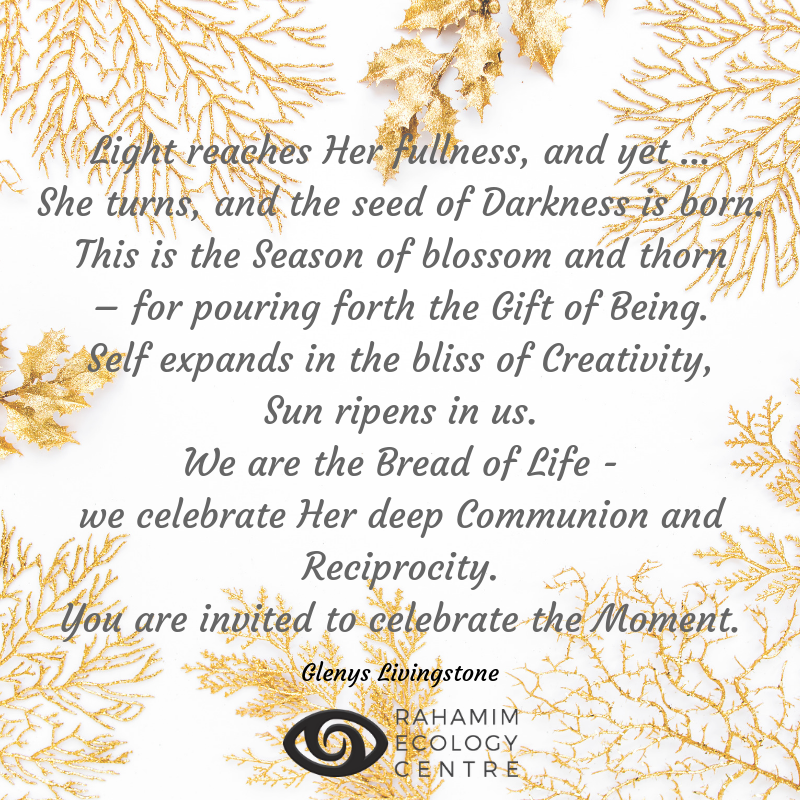 Our Advent stance is one of receptivity – openness to an encounter with the Divine. We honour the changes of this season, our closest contact with the sun, our mother star and source of all life on Earth. Have you heard about Rahamim’s new podcast? This is a series of recent interviews with those who have been pioneers in crossing a “Threshold” in their own consciousness in relationship with Earth. Patricia Powell rsm OAM, Rahamim’s founding member and current mentor. 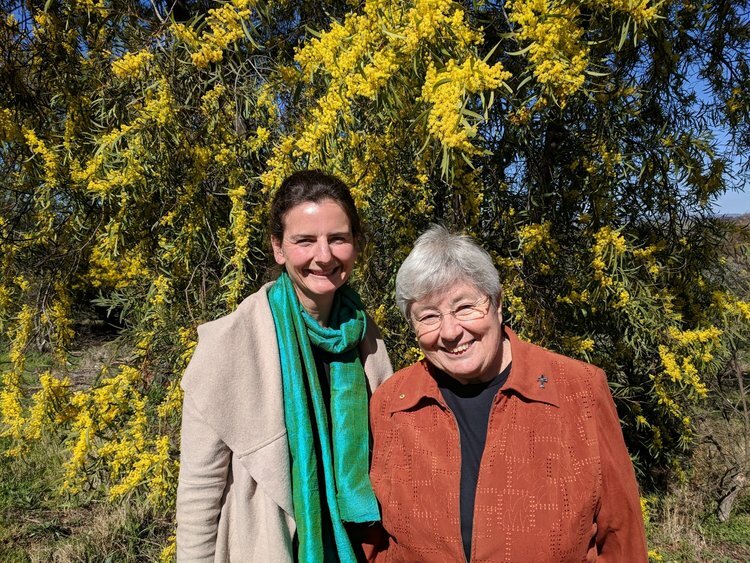 The December release will feature Australian renown permaculture leader and Quaker, Rowe Morrow, and her work traveling the world helping displaced people put down new roots.